As a Gamecock fan when I hear the name Jarvis Giles I immediately think back to late 2008 and the recruiting buzz surrounding the 4 star RB from Tampa. Giles was rated as one of the best Running Backs in the country according to most publications. He gave an initial verbal commitment to Tennessee and from all of the chatter it seemed as if that is where he'd be playing football. Then, the news began circulating that the Vols head coach Phillip Fulmer was forced to resign. Giles soon began to rethink his decision. He then decided to take an official visit to South Carolina in November of the same year. The buzz reached new heights at this point, Gamecocks fans knew we had a shot to land Giles. Soon after his official visit, Giles decided to de-commit from Tennessee and become a Gamecock. He would also be an early enrollee and would be able to come in and immediately begin working to compete for playing time. Jarvis recalled one of the main reasons he decided to choose South Carolina, “It was close to home and I wanted my family to be able to come see me play”. Giles came in and competed right away and played as a freshman. He rushed for nearly 300 yards and at times showed flashes of his cutting ability and speed but was still learning how to play the position at the collegiate level. 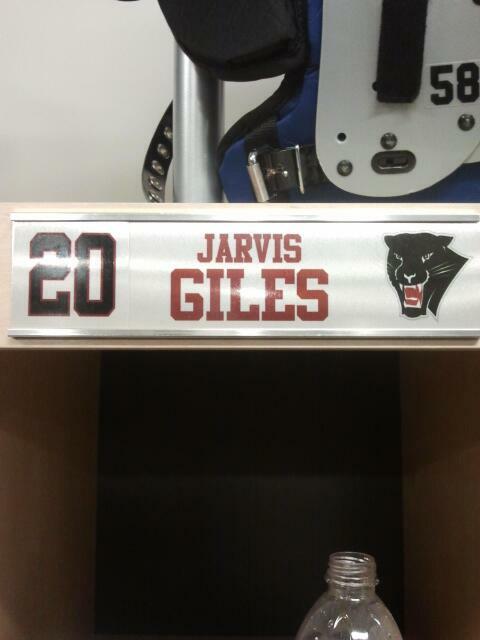 Giles had hopes of getting more playing time the next season with a little off season work. The next season Marcus Lattimore came bursting into the scene taking Gamecock Nation by storm and quickly became one of the best backs in the SEC and Country and with the overall depth at the position, getting any consistent playing time would be a difficult task. No matter how Gamecock fans remember his time at South Carolina, you can never fault him for choosing to transfer. “South Carolina was great, some of the best moments in my life and I will always remember those days," Giles said. He was granted a full release from the University. Giles chose to join Charlie Strong and become a Louisville Cardinal but would have to sit out in 2011 and not become eligible to play until the 2012 season. During this time Jarvis had a lot of personal issues arise including the death of his Grandmother and the birth of his son. Before ever playing a down at Louisville he put his football career on hold and went back down to Florida to focus on his family. “It was a time when a lot was going and I knew my family needed me," Giles said. We also wish the best for you Jarvis. The second game of the season he will be back in South Carolina as they face Newberry. comment below using your facebook account. Gamecock Nation Ready To Make Good On Promise? All Rights Reserved BlockCBlog.com Copyright © 2016. Powered by Blogger.